For my birthday, I got some beers I don’t usually drink (thank you Dav), so I thought I’d mention them. I opened the Elysian Night Owl Pumpkin Ale with trepidation, but it had no pumpkin flavor I could detect (though they say it’s brewed with pumpkin and pumpkin seeds), only somewhat subtle pumpkin pie spices. Alcohol content was 5.9%. Overall, I’d say it was mild. By contrast, drinking Sam’l Smith organic cherry fruit ale really seemed more like drinking cherry juice than beer. I didn’t notice the alcohol going down, though I guess it was there (no percentage was listed). Nice and fruity, rather than the uneasy mix that flavored beers often are. I expected Lip Stinger (from McTarnahan’s) to be spicy, since it was “fermented with peppercorn.” Apparently they meant the singular — I could detect no pepper. It was just a beer. Alcohol content was 4.8%. Fat Scotch Ale from Silvery City Brewery was just what I expected: scotch ale. I’m not sure what makes it that way — “a touch of peat character” I suppose. Alcohol content was 9%, which is probably also what makes it taste like what I expected. Elysian’s The Immortal IPA was a nice India pale ale, definitely hoppy. 6.3% alcohol content. Bear Republic’s Hop Rod Rye was slightly bitter but not at all unpleasant. 8% alcohol content. So what was my favorite? Probably Fat Scotch Ale, as the most distinctive. And Lip Stinger seemed oddly lacking in character. I put a more official announcement here (with info on becoming a beta tester), but I am bringing my first published game (Apple called it Jigsaw Strategy Game when they briefly published it for Newton) to iPhone (and iPod touch). The game was intended to be played on a handheld, and take only a few minutes to play, so I think it should work pretty well on iPhone. Of course, it will need a little updating from the black & white original pictured here. I’ll be posting more about that in the future. One really nice feature (not sure if it’s new in 3.2 or if I hadn’t noticed it before) is how you can look at sample code. API documentation has a link to sample code that uses the call. Click that link, and from the sample code page, click “Open Project in Xcode.” The project is downloaded and, well, opens in Xcode. Very nice integration. As I mentioned, I am using the new clang compiler and LLVM back end in the latest update (version 1.2.5) to my Opal outliner. I couldn’t really detect any differences in performance, but I’ll take the faster compiles! The clang code analyzer did find a number of minor memory leaks, mostly in things that are less common, like printing or using the bookmark popup. So this release is cleaner than ever. I guess each generation is going to use technology differently, but it seems odd that my granddaughters prefer using MySpace to contact people, rather than e-mail *. This means they can only contact people who are on MySpace — for example, excluding me. It reminds me of the old days, when my editor set me up with an MCI Mail account so I could contact him. And most of my contacts were on CompuServe. It was a huge day when the services finally started sending e-mail to each other (and even longer before everyone got standardized into the name@domain addresses). I hope we don’t go back to the old days! * My granddaughters do use SMS, but due to its cost structure, text messages aren’t really a universal medium. 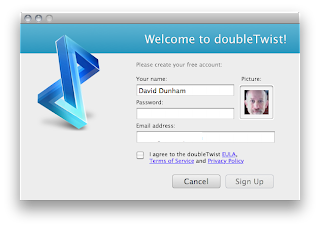 Even though I’m happy enough with iTunes, I wanted to check out doubleTwist. But they have a huge barrier to entry: when you launch the application on your computer, you need to create an account. That almost made me quit right there, but I decided to check out the fine print, as per the links in the dialog. And when I want to the web site to post a question about this, they wanted me to register first. So much for doubleTwist. I’m not giving someone my e-mail without knowing more. Addendum: Apparently Help > Contact Support uses regular e-mail, so there is at least a standard way to contact them.